If it’s time for a mobile upgrade, you have your work cut out for you. 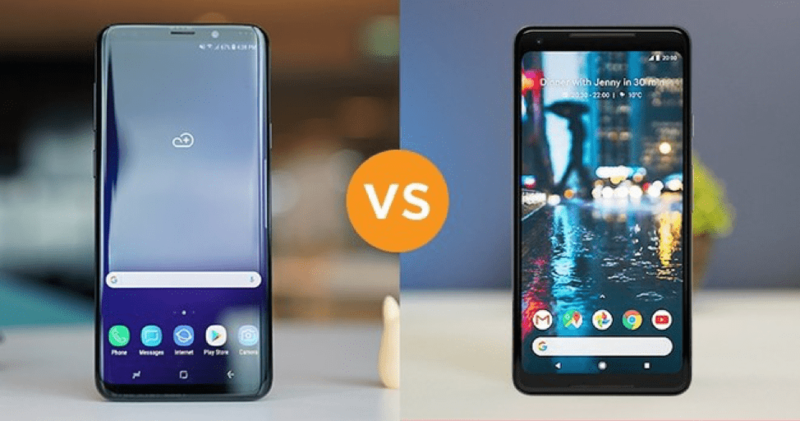 You have the choice between two of the best Androids of the world: the Pixel 2 and the Galaxy S9. Most people play a game of mobile eenymeeniemineymo when faced with this dilemma but leaving it up to chance isn’t for everyone. If you’d rather make an informed decision about your next handset, keep scrolling. Let’s look at these top Androids and see which one deserves a spot in your back pocket. Squint and you may not notice the difference between handsets, even though the S9 proudly bears its manufacturer’s name in bold capital letters on its back. You don’t need to get your eyesight checked; on the surface, these phones look remarkably the same. They share similar specs in terms of dimensions. Overall, the Pixel is slighter and lighter than the S9, but when you measure the difference in millimeters and grams, these minor discrepancies won’t impact the user experience. Both are easy to use with just one hand, especially when compared to the growing market of phablets beefing up the competition. They also share fingerprint sensors in the same position. This is a change from the S8, which had a sensor to the right of its camera. Now, both biometric scanners are strategically situated on the upper-center of the handset’s respective backing, below their cameras. The only difference is Google’s sensor is round while Samsung’s is a rectangle. Google has more or less maintained its three color options from the previous Pixel generation with Clearly White, Just Black, and Kinda Blue. Meanwhile, Samsung has beefed up its color selection with Midnight Black, Lilac Purple, Coral Blue, and Titanium Gray. Perhaps your color option is a moot point in this particular showdown when companies like dbrand make it so easy to upgrade any handset with premium decals or skins. Cut to fit either the Pixel or S9 down to the last micro-millimeter, these skins provide the best coverage without any of the typical adhesives you get from a decal. You can customize a Pixel skin as easily as you can tailor a Galaxy S9 decal. 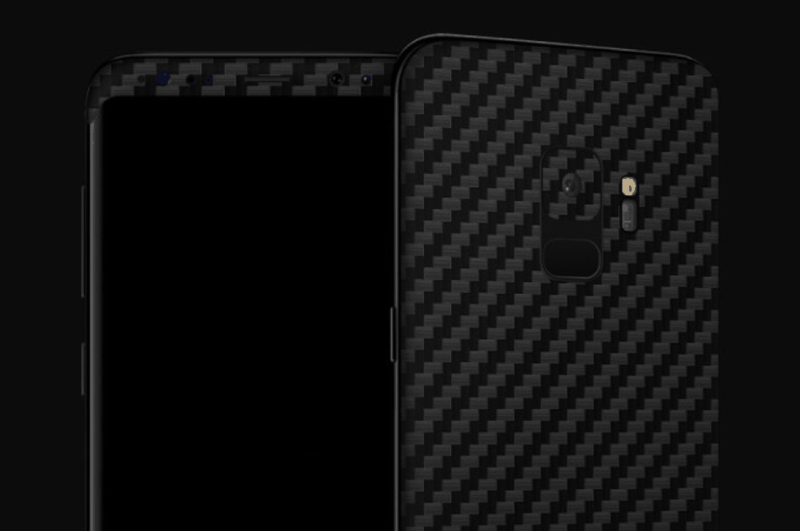 You can choose from textures like black camo and concrete to create a totally unique smartphone drastically different from what either manufacturer offers. The Galaxy boasts Samsung’s trademark Infinity Edge display, which boosts the S9’s usable screen space. At 5.8-inch, its18.5:9 display means just over 80 percent of its front is usable screen space. Compare this to the Pixel’s 5-inch 16:9 display — which clocks its usable screen space to just 70 percent of the front display. A difference of more than ten percent is a big deal on devices of this size, so you’ll able to see Google has the smaller display. The Pixel also loses when compared to S9’s screen quality. Samsung boosted the previous S8’s display brightness by 15 percent, making the Galaxy flagship one of the most vibrant displays on the market. While the Pixel 2’s OLED panel deliversa quality display, it just can’t stand up to the S9. Peel back their respective chassis, and you’ll start to find where these two handsets differ—but don’t expect gross disparity. Simply by having the later release date, the S9 has the Snapdragon 845 processor, while the Pixel 2 only has Snapdragon 835. They both offer 4 GB of RAM with options of 64 or 128 GB of storage, though the Galaxy also has an option of 256 GB and expandable storage with a microSD slot that’s lacking in the Pixel. The Galaxy also has 300mAh on the Pixel 2’s battery, but this difference is negligible when put to the test. Where the Galaxy pulled ahead in the previous categories, things start to level out again when you compare cameras. They offer many of the same features, including multi-frame advanced processing (or HDR+). 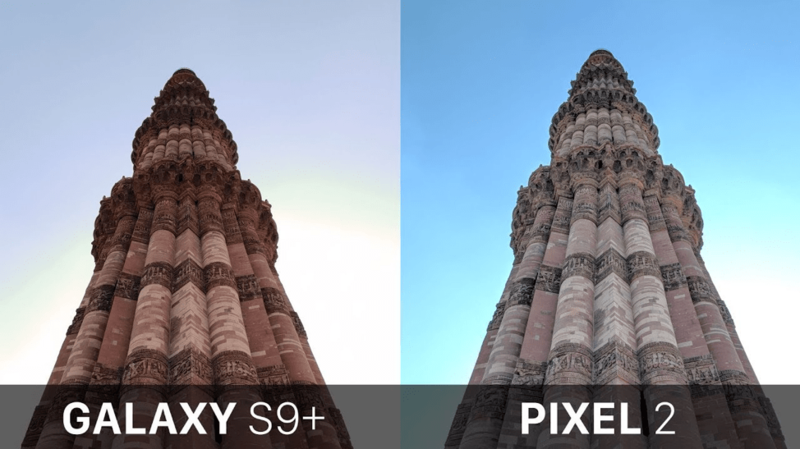 Ultimately, the Pixel 2 ends up taking more dramatic shots with high intensity colors and contrasts—which look better on the screen than the Galaxy’s true-to-life snaps. Out of the box, they both run Android 8.0 Oreo, but you can upgrade the Pixel to Oreo 8.1. It’s here that you’ll find the greatest difference in these two handsets. While the Pixel 2 has a smooth, relatively easy UI, the S9 gets bogged down by too many features—a common flaw amongst Samsung handset. The Pixel feels minimalistic by comparison — sophisticated where the Galaxy feels needlessly complicated. While Samsung edges out Google in terms of features, it’s not a done deal for the Galaxy. The S9 certainly comes with slightly more processing power and a brighter display, its approach to UI wastes the lead these features affordit. It’s certainly flashier with its larger battery and newer processor, but it lacks the simplicity of use and the amazing camera that Google has perfected. They’re both great phones for different reasons. What it will probably come down to is the price. The Galaxy S9’s final price tag is slightly more, leaving the Pixel 2 as the option for those more budget-conscious shoppers. Think about it and weigh features against the price. It’s a better system than a child’s counting rhyme.